Taking a Break- Fast! – Olive For Greens. What do you eat for breakfast? Eggs and toast? Waffles with syrup? Maybe all of the above! That used to be me. Eggs were my main go to and I would go ballistic if I did not have eggs in the fridge. Nothing else really felt like breakfast. Even if I had oatmeal or waffles for breakfast, eggs were on the side. Ridiculous? Probably. But that is the way it was. Even when I started getting serious about healthy, I’d boil my eggs instead of scrambling them in butter. When I read that green smoothies were breakfast, I literally LOL’ed. I thought to myself, that is gross and just not right! I was then challenged to just make it and try it out. I figured I had nothing to lose then took my next challenge- the green smoothie challenge. It took me a while but finally I blended fruits and vegetables together and put the blend contents in a cup. It was not very pretty and did not look appetizing. I stared and sniffled for about 60 seconds then took a gulp. You are probably expecting me to say I instantly fell in love. I did not! It tasted like something I hadn’t had before. I was confused. Then I thought, “Maybe I messed it up… How can I fix this?” The key? It was not sweet enough. I added extra fruit, blended again then tasted it again. It was much better! After 3 days of doing this I made my usual breakfast again. I did not like how I left afterwards. After drinking the green smoothie, I felt light. After my regular breakfast, I felt heavy. That airy feeling helped me stick to my green smoothies in the morning. I always start my day with a tall glass of water and my vitamins. After about 30 minutes, or when I am hungry, I drink my green smoothie. I usually make a big batch that last 3-4 days- depends on how hungry I am. Green smoothies are really filling and super healthy. Give it the benefit of the doubt. 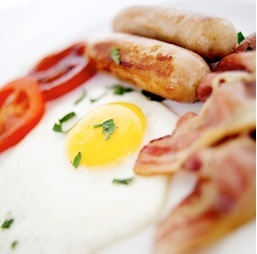 Give your usual breakfast a break and see how you feel afterwards. Occasionally on the weekends, I do have “regular breakfast foods” but I watch my portions and always start my day with a glass of water. Depending on my plans for the day, I may have the green smoothie for lunch. Remember to adjust any green smoothie recipe you find to match your taste buds. This drink should not be forced down but enjoyed! Green smoothies are becoming very popular. I’d like to suggest waiting 30 minutes AFTER consuming a glass of water in the morning. Why? Because we naturally wake up dehydrated and can confuse thirst for hunger. Also, if you’ve never had a green smoothie before start slow. Drink 16 ounces (about 2 cups) of green smoothie then work your way up to 32 ounces. Most of my smoothie (and food!) recipes come from what’s left in my refrigerator. Here are two smoothies I made from what’s-in-the-fridge. The first smoothie, Cherry Blossom, is made with greens and cherries and strawberries. 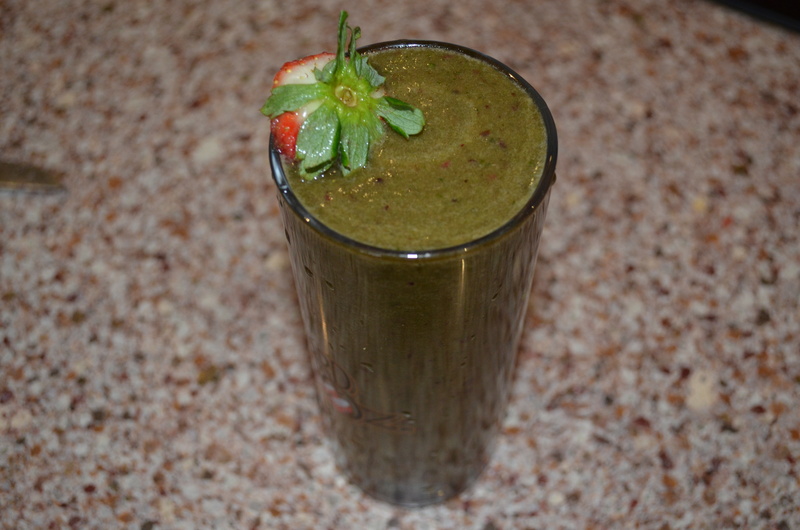 The red fruits give this smoothie a darker shade of green with red flecks throughout. Don’t be intimidated by the color! Looks can be deceiving. The second smoothie, Non-Chemical Romance, is a tasty smoothie with a “greener” taste. Remember, the sweetness can be adjusted to your taste buds. The name, Non-Chemical Romance, was inspired by the bright green color it turns once blended. Note: The parsley is optional because most people don’t have this item readily available. The Pear is optional for an added extra sweetness. Most people, new to drinking green smoothies, prefer a sweeter smoothie. Tip: For a sweeter smoothie use a red apple and/or add ½ of a banana. Blend each of the above items one at a time, in that order, until smooth. Drink a glass (or 2 glasses depending on your hunger) for breakfast. This batch can last 2-4 serving, about 1 or 2 days. Everyone is different. Tip: If the consistency is too thick for your liking, add more water or blend longer. Make a huge batch and store in the refrigerator for up to 5 days. This is not your traditional fruit and ice smoothie you may be used it. Please note, you can add ice to the blender if you are drinking immediately and want it colder. Or you can add ice cubes to your glass. Whoa these sound delicious. Will definitely be trying them!!! Pingback: Healthy Snack Ideas: Spiced Apples with Almond butter & Cina-trail Mix | OliveforGreens! 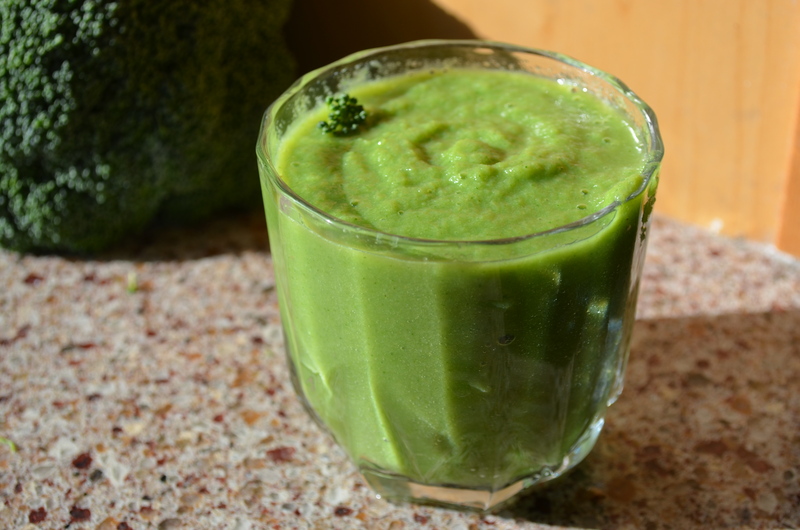 Pingback: 3 Green [Not SO Green] Smoothie Recipes! | OliveforGreens!